At The Pall Ring Company we are able to provide our customers with an extensive range of liquid distribution systems. Using our expertise to combine injection moulded sections with traditional fabrication, we can provide a strong, dimensionally accurate product which can be manufactured in a range of different thermoplastics materials or from stainless steel. These distributors can be used in towers up to 4.5 m in diameter. 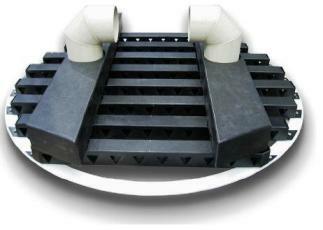 A tray type distributor consists of a simple flat tray with a series of orifices evenly spaced over its entire area. The liquid is fed directly onto the tray by a feed pipe, which then distributes the liquid evenly over the tower’s packed bed. Tray type distributors are often fitted with riser tubes to allow the unhindered passage of the gas stream up through the tray, to provide a uniform flow of liquid down through it and to minimise hold-up and prevent over-flowing. Additional tray support beams should be considered in larger towers to provide the necessary structural support. Tray type distributors can be fabricated and supplied in a range of thermoplastics or stainless steel. A trough type distributor consists of a pre-distribution trough or ‘parting-box’ mounted above a number of equally spaced, narrow troughs. Initially, the liquid is fed into the ‘parting-box’, which in turn evenly feeds the troughs below. One ‘parting-box’ is usually sufficient for smaller diameter towers but multiple boxes may be required for larger diameter towers or for high liquid flow rates. Additional trough support beams should be considered in larger towers to provide the necessary structural support. Trough type distributors can be fabricated and supplied in a range of thermoplastics or stainless steel. A ladder type distributor consists of a main central feed pipe or ‘header’, with a number of equally spaced ‘laterals’ projecting perpendicular from each side. Here, the liquid distribution is pressure driven, as liquid is delivered onto the tower’s packed bed through a series of holes in the underside of the lateral pipes. This type of distributor is highly versatile and can be designed to suit a wide variety of applications. Ladder type distributors are not usually recommended for use with low liquid flow rates or in systems where there may be suspended solids in the liquid, which could lead to the blocking of the distributor’s holes. Ladder type distributors can be fabricated and supplied in a range of thermoplastics or stainless steel. PLEASE TELEPHONE US FOR ANY TECHNICAL ASSISTANCE YOU REQUIRE OR ALTERNATIVELY COMPLETE THE TOWER INTERNALS ENQUIRY FORM FOR A PROMPT REPLY.